Wearing some colourful pants to the office. Well, one pair of colourful pants, and sneaking in a pair of coloured jeans to work and passing them off as normal pants. Since I'm doing the Frocktober challenge this year, I wanted to try wear something other than dresses to the office (I wore these back at the end of September). When I get around to posting my October outfits, it's going to be all dresses! 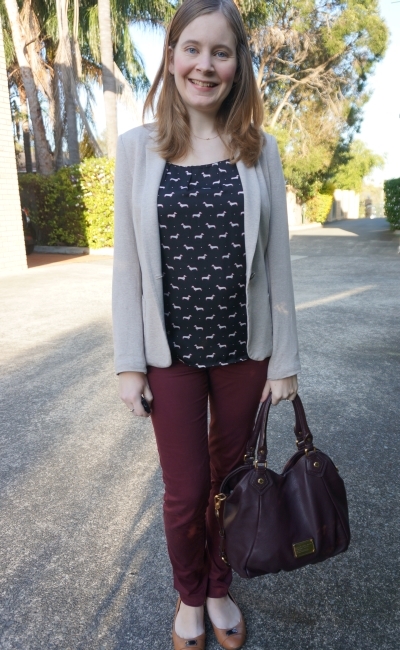 I've worn this top with red pants before, so it was an easy choice to try my burgundy ones. I really liked this outfit combination! The blazer and pants combo I've worn together before too, there was very little thinking required around this outfit. Nice and simple. It was good to be able to wear these pants again, the last time I wore them I was in the accident and injured my knee. But it's healing up nicely! 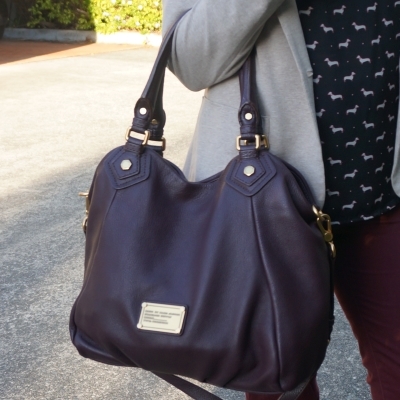 Last worn: jersey blazer, dachshund print blouse, burgundy pants, camel flats, Marc by Marc Jacobs Fran bag. Other ways to wear: jersey blazer and jeans, dachshund print blouse and a pencil skirt, burgundy pants on the weekend, camel flats and a plaid shirt, Marc by Marc Jacobs Fran bag and leopard print pants. Since I've previously shared some of the colourful pants available at Shopbop, I thought I'd show you the great blazers instead! There is a Rag & Bone blazer that's really similar to the one I'm wearing above, but it is on the more expensive side. I have worn these jeans into the office before, so I decided to wear them that way again. They are quite a dark grey and you wouldn't really know they were denim just by glancing at them. They work nicely for my business casual office that is more casual than business. Last worn: Zara black jersey blazer, polka dot ruffle tank, grey skinny jeans, black ballet flats, Marc by Marc Jacobs Fran bag (above). Other ways to wear: black blazer and a striped dress, polka dot ruffle tank and red accessories, grey skinny jeans in summer, ballet flats and a pencil skirt, Marc by Marc Jacobs Fran bag and a little red dress. Linking up with Let It Shine, Shoe and Tell, More Pieces of Me, Sincerely Jenna, Mix It Monday, Style Sessions, Confident Twosday, On Trend Tuesday, Turning Heads, Wardrobe Wednesday. Love your bag!!! Great looks! I love blazers, you look so pretty in these outfits. I definitely push the limits with colored denim at the office. Especially when I'm going to be at a job site and know I will be all dusty any way! I had to buy multiple hues of my burgundy pants because I was wearing them so often! Love them paired with the navy print! And you always get me with that Fran! another positively fab duo of outfits! thanks, mica! Yep, so happy I could 'sneak' them into the office. Although takes all the fun away when you work with people wearing normal blue denim on a weekday, haha! I love your burgundy pants! I think I commented on them before, and now I finally have a similar pair from Old Navy! Old Navy seems to be my equivalent of Jeanswest--their petite stuff fits me great! (Although I need to try out more of their petite pants selection!) Love the Zara blazer too, it looks really comfy but professional (the best combo!)! I love blazers, they go so good with everything. The first printed top is too cute! Those maroon pants are everything! I definitely need to get me a pair for fall. The Ricky ruffle blouse is adorable. I like the blazers that you chose as well especially the red windowpane pattern. Hope your Froctober started off good! I really like the color combinations that you're wearing in these two looks. I especially am loving those wine colored pants! I LOVE blazers! I really like the color of your pants in the first outfit! Have a happy Monday! Love the rich wine color in this look! The second screams : I am going to the office but its Fri-yay! The first outfit is indeed simple yet looks nice, Mica! Black is beautiful! Lovely outfit, hun! And wow, may God bless you who have the kind heart to help the less fortunates. Love the printed top in the second look! Great look! Yes to this! I love blazers with a passion. I've especially been loving long, oversized blazers lately, or boyfriend blazers - whatever they call them lol. Thanks for adding a cool collection, that red one on the bottom row is so crazy I want it! Blazers are definitely popular this fall and winter season. Personally, I think they're always in. HaHaHa They always polish off a look and pull one together. They look great with your outfits Mica. Yes I need a good pair of black denim (not my super skinny ones) that I can wear to work. Haven't found any yet. cool look, I especially like the bag! I adore your first look. The color of the pants are just perfect! That pair of burgundy pants is really nice, I would love to own something like that. I like this outfit combination too, the way those pants look with blouse is really great. The second outfit is lovely too, especially I like that feminine blouse with ruched. It's so pretty! Chic, lady! Loving the bag! Thanks Nikki! I've got my frocktober daily outfits over on instagram right now until I get through this backlog of blog photos! It's a good reason to wear through my collection and find out if I really need more than 31 dresses! haha yes I was very grateful for being injury free! Your post came in great timing! I've been searching for the perfect blazer for a nice business casual look. I'll definitely have to check out these recommendations. They all look fabulous! I love that first outfit! The whole look is so classic and sleek. Your purse is so adorable! Love it!! 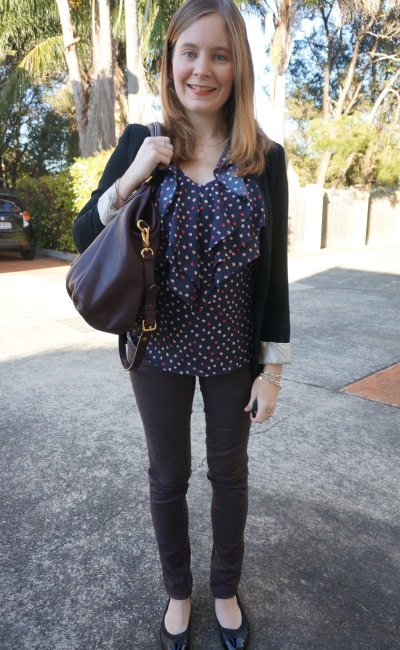 Both of these looks are great--I love those pretty printed blouses. Especially the cute dog print, that is adorable. I think I need some burgundy pants--I love those! It's always nice to have lots of wardrobe flexibly at work and you can totally pass off those jeans as proper pants. Yep I'm so lucky we have such a relaxed dress code - others wear blue denim through the week but I try reserve that for casual Fridays! what a cute dog print top! 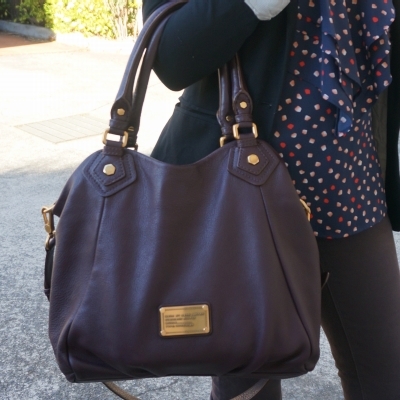 Ooh, loving the Fran Bag! Easier to use than the Hillier with the wider opening. Loving the colour too. I miss office style - so it's fun to check yours out. I like both outfits (and tops) but the second one really stole my heart! There si something so romantic about those ruffles. I love the print on the first top! So cute. I love the burgundy trousers and I'd definitely wear the grey trousers if I could get away with it! I wouldn't have known they were denim if you hadn't said. Unfortunately I have the opposite problem as you - I have hardly any trousers as I can't find any long enough :( Just means I have to make do with dresses.... such a shame! Aww no! I guess being petite and having things too long is the perfect problem really as they can always be taken up, you can't always add length to your pants! I used to wear the pants in the office - they can look well and elegant and you feel cosy in these clothes. The second look is my fave - it's so pretty! Those ruffles add a little playfulness to your professional look! Very polished and the color combination is wonderful! That second outfit is amazing!!! I love everything about it!